Get the right gear.Choose shoes with proper arch support, a firm heel and thick flexible soles to cushion your feet and absorb shock. Wear comfortable clothes and gear appropriate for various types of weather. If you walk outdoors when it’s dark, wear bright colors or reflective tape for visibility. Choose your course carefully.If you’ll be walking outdoors, avoid paths with cracked sidewalks, potholes, low-hanging limbs or uneven turf. If the weather isn’t appropriate for walking, consider walking in a shopping mall that offers open times for walkers. Warm up.Walk slowly for five to 10 minutes to warm up your muscles and prepare your body for exercise. Cool down.At the end of your walk, walk slowly for five to 10 minutes to help your muscles cool down. After you cool down, gently stretch your muscles. If you’d rather stretch before you walk, remember to warm up first. For most healthy adults, the Department of Health and Human Services guidelines recommend at least 150 minutes of moderate aerobic activity, 75 minutes of vigorous aerobic activity, or an equivalent combination of moderate and vigorous aerobic activity a week. Physical activity can be spread throughout the week. The guidelines also recommend strength training exercises of all the major muscle groups at least twice a week. As a general goal, aim for at least 30 minutes of physical activity a day. If you can’t set aside that much time, try several 10-minute sessions throughout the day. Record these numbers in a walking journal or log them in a spreadsheet or a physical activity app. Another option is to use an electronic device such as a pedometer to calculate steps and distance. Set yourself up for success.Start with a simple goal, such as, “I’ll take a 10-minute walk during my lunch break.” When your 10-minute walk becomes a habit, set a new goal, such as, “I’ll walk for 20 minutes after work.” Find specific times for walks. Soon you could be reaching for goals that once seemed impossible. 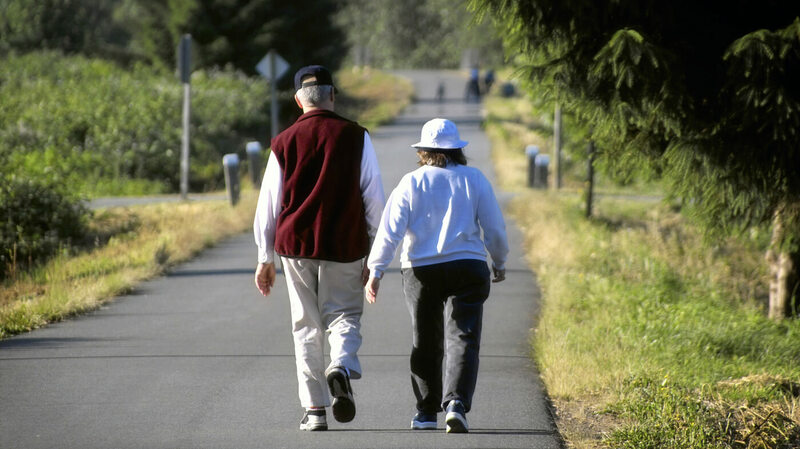 Make walking enjoyable.If you don’t enjoy solitary walks, ask a friend or neighbor to join you. If you’re invigorated by groups, join a health club. You might like listening to music while you walk. Vary your routine.If you walk outdoors, plan several different routes for variety. If you’re walking alone, be sure to tell someone which route you’re taking. Walk in safe, well-lit locations. Take missed days in stride.If you find yourself skipping your daily walks, don’t give up. Remind yourself how good you feel when you include physical activity in your daily routine, and then get back on track.